For the bowhunting world, deer season is the penultimate time of year. To land that trophy buck, we are willing spend thousands of dollars and hundreds of hours scouting and hunting. But that buck pales in comparison to a bull elk. Bringing down one of these 500lb behemoths takes more than a normal broadhead, you should use only the best broadheads for elk hunting if you want to make your shot count. There is a lot of contradictory advice on what makes a broadhead specifically good for elk hunting. In most cases, you can use the same broadhead for deer and elk as long as you use a quality broadhead. Elk have very thick, sturdy bones and lesser broadheads can be absolutely destroyed if your shot placement is off. Most people see the size of an elk and think they are going to need a bigger broadhead that makes a bigger hole. This isn’t true. What you need is a specific arrow and broadhead combination for elk that is both stiff and heavy to get maximum penetration. The kinetic energy or arrow momentum for elk is one of the key characteristics we are going to look for. The energy applied to the arrow at the bow string needs to be effetely transferred to the arrow tip on impact. This will help you get through the heavy muscle and thick bone of a mature specimen. That said, many people overly concern themselves with weights when elk hunting. It is a factor but the most important factor when determining your total arrow weight for elk is to match it with your bow. While energy transfer and mass are important, neither is as important as a solid, well placed hit. The best weight broadhead for elk is the heaviest your bow can accurately shoot. So, let’s get over this idea that we have to have a mechanical broadhead for elk. Sure, you want the biggest hole you can get with your equipment but don’t sacrifice everything else just to get a broadhead with big blades. In many cases, I prefer fixed broadheads for elk over mechanical even though they are often a little more challenging to shoot well. While deer aren’t exactly small, elk are huge! They are big animals and getting all of that weight and muscle moving takes a big heart and a lot of air. If you hit solid, most elk won’t run like a deer. They may run but not as far or as fast. If you can make one bleed and get a good lung shot, he will go down. As stated above, you want a stiff arrow with a heavy broadhead if your bow can handle it. Elk broadhead recommendations vary depending on the hunter but the best person to make the decision on what will suit you and your equipment best is you. Understanding your broadhead options will make that much easier. Whether you choose to use a fixed or mechanical broadhead is really up to how well you shoot each type. Fixed blades are often a little more challenging to shoot and will require more time and care in tuning them to your bow. Most mechanical broadheads will shoot more like your field points and be easier overall to deal with. I have noticed a trend for mechanical broadheads, especially those with very large cutting diameter to faulter in the animal’s flesh. If you don’t hit a lung and make a hole through both sides of an elk, you may see him bolt and never see him again. One hole is just not enough damage. Most people will recommend a chisel tip broadhead for elk. I don’t disagree with this but will add that cut on contact broadheads with a strong tip will accomplish the same thing. Avoid thin blades up front and opt for points that are supported by a lot of steel. As I said above, the weight is really dependent on your bow but choose the highest grain broadhead for elk that you can accurately shoot from your bow. I have seen elk taken with as low as 85 grain broadheads on stiff arrows but would prefer a 125 grain broadhead if I could properly shoot one. Broadheads that heavy are usually shot out of crossbows or very powerful compound bows. If you choose mechanical, a 2 blade broadhead for elk is quite sufficient but for fixed blade, I prefer a 3 blade option. Just remember the more numerous and larger the blades, the thinner and weaker they will be at a given weight. While your broadheads aren’t required to be immensely strong, it is a good idea to not have them too weak or they may be damaged or broken by bone before they get deep enough to do their job. As stated, larger is better if you aren’t sacrificing to get it. Some people swear by a 2” or greater cutting diameter but if you can get a solid inch on a good arrow and get it in the lung, it will be enough. I wouldn’t go less than an inch as a safety margin. If you have very large blades, an errant impact on a rib may break one blade. If this happens, your hit may faulter or at least not do the damage the broadhead was designed to do. I find overall strength to be more important for elk. If you would like more information on broadheads and their uses you can check outour article here which should provide you with a solid understanding of everything broadhead related. This is simply my favorite broadhead to come out in recent years. I have used it to take everything from turkey to hog and hope to take it up against bear in the north woods this year. My personal thoughts are that a three blade broadhead leaves a better wound. For elk, this is a powerhouse of a broadhead that will blow through both sides out of a good bow and should drop an elk in short order. It may not be the largest cutting diameter out there but very few broadheads are this tough while still having as much penetration as the Montec. This leads the pack when it comes to my preferred broadheads for elk. Slick Trick broadheads are dominating the elk market right now. There are a lot of options but if I had to pick one of the many Slick Trick broadheads for elk hunting it would be the magnum. Once again, we have a rather small cutting diameter but penetration second to none! Even the Slick Trick standard broadheads are lethal and would work well but the Magnum has a sharp chisel tip that should help get past bone and blow through vital organs. They resemble the classic pattern of broadheads from back in the 80s but the materials and quality are far better than those old designs. These are quality broadheads for elk hunting. The Buzzcut may lack some of the flash of modern broadheads and it may not be the sturdiest but it will penetrate like no other. I love the classic flying razor design. If you squint really hard, you can see how this is patterned like a lot of the stone points used by our hunting ancestors. If it worked for them, it should do for us. This is the smallest cutting diameter broadhead on our list but don’t let that sway you away from it. For a fixed broadhead this shoots a lot like a field point. It is highly accurate and will drop most any game, elk included. If you like a classic pattern, it doesn’t get much better. Rage Broadheads have dominated the market with their selection for hunting most game animals. If you hunt Turkey, I can’t think of any better. But when it comes to Rage broadheads for elk, I am not a fan of the huge cutting diameter of most of their options. The Chisel is a little smaller than most Rage broadheads but is still the largest on this list. The point is very strong and can take a bone hit and shatter its way through. It cuts well and does a lot of damage. It may not have the penetration of some of the others but If you want a Rage broadhead for elk, the Chisel is the way to go. Muzzy is a brand that has been around for ages. More animals, elk included, have probably been taken by Muzzy broadheads than any other company out there. They are well known to be accurate and easy to shoot while being deadly penetrators. Where elk are concerned, I would consider the Phantom to be the flagship of Muzzy’s broadhead line. Much like the Stinger above, it isn’t the most durable broadhead but it is among the deadliest for sure. Often these can be found very cheap and are still quality enough to be trusted on your next hunt. ​Learn to deal with the stress of the shot. If you are not an avid hunter, the first time you draw you bow on an elk, the excitement can take over and you may make poor decisions. I recommend shooting in tournaments, hunting small game, or doing a lot of 3D shooting to be as ready as you can. Elk are a lot bigger than deer and can throw newer hunters off on their range estimation. Either learn to get your range dead on without using your target as a guide or invest in a decent rangefinder. The vital zone on an elk is lower than on a deer. If you hit high on an elk, it will likely do nothing other than send it running. IF you want a successful shot, hit the elk lower and a good foot behind the trailing edge of the leg near the bottom of the swell of the shoulder. The rack on an elk differs from that of a deer. Learn to quickly count the points and understand the differences in how elk antlers grow. If you are tracking or stalking elk, do it later in the day. Wait until the sun is up to do your scouting. Elk will be more alert before and just after dawn than they will around 10:00 to noon. Unlike stalking, when on the hunt you need to focus on times of the lowest light you can safely and legally hunt. Your chances during the bright of day are much worse than your chances at dawn or dusk. Elk love their bedding areas. You can follow them anywhere else but never follow them into a bedding site. If you do, they are likely to leave and never return. Though this is good advice for hunting most animals, with elk it is vital to wait for a broadside shot. If you hit front on or even quartered to the shoulder, it will be much harder for your broadhead to do the damage it needs to take the elk down. As we discussed above, penetration is key to taking down elk. You best bet is to send an arrow straight through him. To do this you will need a very powerful bow, one pulling in the 55-65 pound range if you can manage it. Elk are not deer. Elk are smart. Where a deer may behave more cautiously if they are feeling pressured, an elk will just leave the area. If you want your best shot at a big bull, you need to head deeper into the woods than most hunters. The season and legal part of elk hunting differs greatly from state to state and is often not like deer season at all. Make sure you know the laws where you are going to hunt. My preference is for a strong, fixed blade broadhead with three blades. 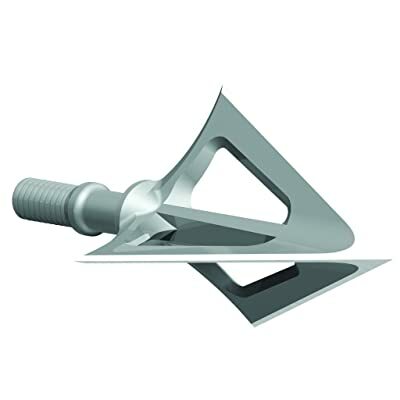 Many people have been successful with mechanical broadheads. Whatever you pick needs to be the best penetrating broadheads you can get your hands on in the style you want. While it is our endeavor to pick only the best broadheads for elk hunting, the choice is yours. Find something that suits your bow and shooting style. I would strongly recommend trying a few different broadheads to see how they shoot out of your bow.